I will admit that an artist may be great and limited; by one word he may light up an abyss of soul; but there must be this one magical and unique word. George Augustus Moore (24 February 1852 – 21 January 1933) was an Irish novelist, short story writer, poet, art critic, memoirist and dramatist. Impressions and Opinions (1891): "Balzac". Impressions and Opinions (1891): "Mummer-Worship". The public will accept a masterpiece, but it will not accept an attempt to write a masterpiece. Vain Fortune, Chapter 1 (1891). I have always noticed that when a fellow wants to finish a play, the only way to do it is to go away to the country and leave no address. He must put his shoulder to the wheel and get it right; one more push, that was all that was wanted. Faith goes out of the window when beauty comes in at the door. The Lake (1905) [Appleton, 2005, digitized edition], ch. IX (p. 169). Hail and Farewell (1912), vol. 2: Salve, Kessinger Publishing, 2005, ISBN 1-417-93272-4, ch. XV (p. 36). The Brook Kerith, ch. 11 (1916). The hours I spend with you I look upon as sort of a perfumed garden, a dim twilight, and a fountain singing to it... you and you alone make me feel that I am alive... Other men it is said have seen angels, but I have seen thee and thou art enough. Letter to Lady Emerald Cunard, quoted in The Everything Wedding Vows Book : Anything and Everything You Could Possibly Say at the Altar, and then Some. (2001) by Janet Anastasio and Michelle Bevilacqua, p. 97. My soul, so far as I understand it, has very kindly taken colour and form from the many various modes of life that self-will and an impetuous temperament have forced me to indulge in. Therefore I may say that I am free from original qualities, defects, tastes, etc. What is mine I have acquired, or, to speak more exactly, chance bestowed, and still bestows, upon me. I came into the world apparently with a nature like a smooth sheet of wax, bearing no impress, but capable of receiving any; of being moulded into all shapes. Terrible is the day when each sees his soul naked, stripped of all veil; that dear soul which he cannot change or discard, and which is so irreparably his. But if you want to be a painter you must go to France — France is the only school of Art. Never could I interest myself in a book if it were not the exact diet my mind required at the time, or in the very immediate future. The mind asked, received, and digested. So much was assimilated, so much expelled; then, after a season, similar demands were made, the same processes were repeated out of sight, below consciousness, as is the case in a well-ordered stomach. Ugliness is trivial, the monstrous is terrible. The world is dying of machinery; that is the great disease, that is the plague that will sweep away and destroy civilization; man will have to rise against it sooner or later. It is said that young men of genius come to London with great poems and dramas in their pockets and find every door closed against them. Chatterton's death perpetuated this legend. But when I, George Moore, came to London in search of literary adventure, I found a ready welcome. Possibly I should not have been accorded any welcome had I been anything but an ordinary person. I will admit that an artist may be great and limited; by one word he may light up an abyss of soul; but there must be this one magical and unique word. Shakespeare gives us the word, Balzac, sometimes, after pages of vain striving, gives us the word, Tourgueneff gives it with miraculous certainty; but Henry James, no; a hundred times he flutters about it; his whole book is one long flutter near to the one magical and unique word, but the word is not spoken; and for want of the word his characters are never resolved out of the haze of nebulae. You are on a bowing acquaintance with them; they pass you in the street, they stop and speak to you, you know how they are dressed, you watch the colour of their eyes. One thing that cannot be denied to the realists: a constant and intense desire to write well, to write artistically. When I think of what they have done in the matter of the use of words, of the myriad verbal effects they have discovered, of the thousand forms of composition they have created, how they have remodelled and refashioned the language in their untiring striving for intensity of expression for the very osmazome of art, I am lost in ultimate wonder and admiration. We all want notoriety; our desires on this point, as upon others, are not noble, but the human is very despicable vermin and only tolerable when it tends to the brute, and away from the evangelical. Humanity is a pigsty, where lions, hypocrites, and the obscene in spirit congregate. After all there is but one race — humanity. It would appear that practical morality consists in making the meeting of men and women as casual as that of animals. One must be in London to see the spring. We humans are more complicated than animals, and we love through the imagination. Self is man's main business; all outside of self is uncertain, all comes from self, all returns to self. 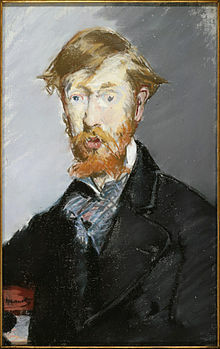 George Moore had a ceaseless preoccupation with painting and the theatre, within certain limits a technical understanding of both; whatever idea possessed him, courage and explosive power; but sacrificed all that seemed to other men good breeding, honour, friendship, in pursuit of what he called the root facts of life. William Butler Yeats, The Autobiography of William Butler Yeats (1926) [Macmillan, 1965, ISBN 0-02-055580-6]: "Dramatis Personae, 1986 - 1902," ch. 7 (p. 269). I told him that he was more mob than man, always an enthusiastic listener or noisy interrupter. Yet I admired him and found myself his advocate. I wrote to Lady Gregory: "He is constantly so likeable that one can believe no evil of him, and then in a moment a kind of a devil takes hold of him, his voice changes, his look changes, and he becomes hateful... It is so hard not to trust him, and yet he is quite untrustworthy. He has what Talleyrand calls 'the terrible gift of familiarity.'" William Butler Yeats, The Autobiography of William Butler Yeats (1926): "Dramatis Personae, 1986 - 1902," ch. 14 (p. 289). Virginia Woolf, letter to V. Sackville West (1926-03-16), from The Letters of Virginia Woolf, vol. 3, 1923 -1928 [Harcourt Brace Jovanovich, New York 1978, ISBN 0-15-150926-3], # 1624 (p. 249).